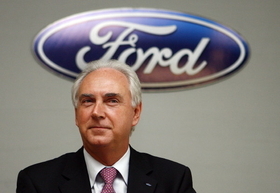 Fleming confirmed that a new small Ford will be built in Romania. Ford of Europe said the first production Transit Connect van came off the assembly line today at its new manufacturing plant in Craiova, Romania. The automaker also confirmed that the factory will build a new small car. John Fleming, Ford of Europe CEO, said: “We are keeping our promise to transform Craiova into a state-of-the-art manufacturing facility." Ford bought the former Daewoo manufacturing plant in southern Romania in March 2008. Fleming said Craiova's small car - which is not the Fiesta or the Ka - is scheduled to go into production in the near future. Ford is not giving details of the new Craiova model but Automotive News Europe sources say it will be a replacement for the carmaker's Fusion minivan, possibly called the B-Max. Craiova also will build a small displacement, advanced EcoBoost gasoline engine. The exact timing for the start of production for both products will be announced at a later date, Ford said. At full capacity, Craiova will be able to produce up to 300,000 vehicles and 300,000 engines annually and provide employment for approximately 7,000 people. The first Transit Connect off the line was donated to Craiova Municipal Hospital for use in its work with the local community. Mid-term, Ford expects to export the majority of Craiova Transit Connect production, mainly to Central and Eastern Europe.